Where are you going? A better question to ask might be, where are you right now? In order to make progress on a journey, you need to know where you are, what your starting point is. If you are using a compass, you first have to know which way North is. Once you’ve determined a reference point then you can move in the right direction. Sometimes we are so focused on going somewhere we don’t take the time to recognize where we actually are. Observing and assessing where you are is like finding your bearings with a compass. Whether it’s looking at a career path, yoga practice, or relationships, taking time to understand the current state can get help us on our journey. It’s a must that we understand the current state exactly as it is. Let go of the inner dialogue about where you could or should be. Wipe away the filters of where you wish you might be. Be honest and truthful with yourself. When we have these honest moments about our present state, the internal compass points of our fire, heart, and intuition can provide guidance without interference. When we are in harmony with these inner navigational tools, are we ever steered in the wrong direction? 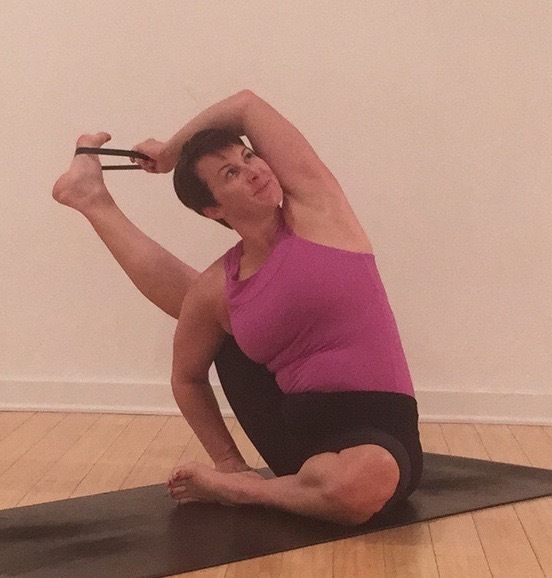 This brings us to this week’s PowerPose, Parivṛtta Sūrya Yantrāsana or Compass Pose. This pose requires opening the shoulders, hips, and hamstrings. It also requires grounding and balance. It can feel a bit like “yoga twister”, but there’s a lot of comfort in it’s complexity and a lot of opportunity for introspection. Option 1: Heron’s Pose Variation. From Baddha Koṇāsana or Bound Angle, take the hands or a strap around one foot. Keeping the hip open, start to straighten the leg out to the side. Use the leverage of the leg to twist the torso toward the foot. Pull the heart towards the foot as the shoulders reach down the back. Gently lift through the pelvic floor. Soften the inner thigh of the bottom leg, keeping the knee and thigh heavy to the floor. For additional extension, press through the ball of the foot, creating a long line through the front of the ankle. Option 2: Find the Bind. Take one leg, draw the knee wide and back until you can position the leg behind the shoulder. Be sure to get the thigh above the elbow, eventually taking the calf on the shoulder. (If that’s not available, continue to work on opening the hip.) Place the hand just to the outside of the the hip to brace the leg in place. Keep reaching the hips to ground toward the floor. With the opposite hand, reach for the foot. If possible, hold the pinky or blade edge of the foot with the thumb pointing down. Sit up as tall as you can. Option 3: With a Strap. Take the leg behind the shoulder and place a strap or binding ring around the foot. Pull the arm back, so the shoulder and elbow are behind the head. The head will peak through the opening of the leg and arm. Start to straighten and reach the leg long. Work slowly here, only going as far as the hamstrings allow. Use the leverage of the strap to find expansion in the heart as well as the leg. Option 4: Parivṛtta Sūrya Yantrāsana. When the body is open enough, find the grab of the foot without the strap. Extend the leg fully and press through the ball of the foot. Turn the heart in the opposite direction, toward the bottom knee. Continue to open the shoulder to create room for the rotation. Before working on this or any other posture, be sure to take an honest look at where you are and what is physically and energetically available to you. This will help ensure that you are working where the practice can be safe and satisfying.